I've been through a lot of revolutions in my attitude towards Judith Leiber. Sometimes I think her bags are tongue-in-cheek and super fun, and sometimes I think they're tacky and overpriced. 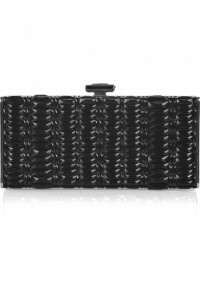 This sophisticated clutch falls partly in the former category and partly in the latter. The design of this hard-cased evening bag is sophisticated and timeless. The surface is entirely covered with hand-placed black and silver crystals and the effect is luxurious and opulent. This is definitely a clutch thats elegant appeal makes it perfect for special occasions. The secret to Leiber's designs is in the details. The faceted clasp at the top propels its decadence to another level, and the delicate chain strap is embellished with gorgeous clear crystals. The only problem is the price. At $1,995, the price is in line with the rest of Leiber's bags, but it's a little too expensive to be reasonable for most of us. The Judith Leiber Leopard Minaudiere, a quirky alternative to this bag.